Anyone who visits the town of Descartes in the South Touraine surly can not help but be impressed by the sight of the majestic River Creuse with its ten-arched bridge and the remarkable memorial on the Descartes side dedicated to local resistance fighters who died in 1944. Le Pont (Bridge) Henri IV, with ten arches which spans the River Creuse has always held a strategic position: a crossing point between the North and South (the Santiago de Compostela road, then the road from Paris to Bordeaux), the border between Touraine and Poitou, the frontier between L’Indre-et-Loire and Vienne, and a demarcation line until 11th November 1942; for this reason, but also because of flooding, it has been destroyed many times. Its existence is acknowledged from as early as 1358, and one of the arches on the right bank dates, in fact, from the XIVth Century. During the Wars of Religions a royal decree ordered that it be demolished in 1569 to stop the advance of the Protestants. 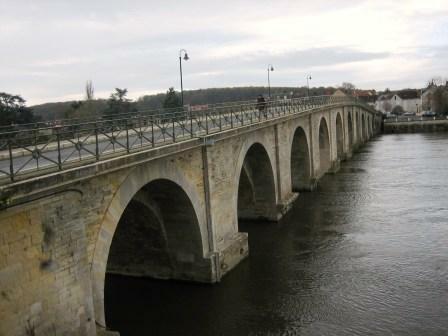 It received the name “Pont Henry IV” in memory of the journey to La Haye of the future king of France on 4th March 1589, following the conciliation treaty of Châtellerault; the king of Navarre had already come close to this town with rather less peaceful intentions (siege of 1587), but had been unable to enter it. The Pont Henry IV had both political and economic importance, because it was situated at the very centre of important river trade: shipping, mills, fishing, tolls for men and goods, salt dealing, and more recently, a dam, factories and reservoirs for leisure pursuits. Regularly weakened by flooding, and dangerously narrow, it was enlarged in 1848 on the Vienne side, and not until 1908 on the Indre-et-Loire side. The Conty-Freslon Network was named after the two leading resistance fighters, Michel Conty and Emile Freslon. Both these heros of the Liberation were captured in a Nazi ambush, tortured and killed in the woods of Kerleroux at Dolus-le-Sec (north of Descartes and to the East of Manthelan) on 27th July, 1944. Pierre Marcou, August 20, 1944. Jacques Martin, August 28, 1944. Pierre Couratin, l September 1944. Joseph Talhouane, l September 1944. Marcel Destouches, l September 1944. Eugene Lavau, l September 1944. Andre Guilbert, September 20, 1944. Jean Croizet, September 24, 1944. Serge Lambert, October 13, 1944. Roland d’Humières, October 15, 1944. Rene Riviere, October 15, 1944. Emile Laurent, October 15, 1944. Georges Soret, November 23, 1944. Charles Dorigny, January 17, 1945. Guy Vaufleury, March 2, 1945. Rene Monnier, March 4, 1945. Jean Lecomte, April 14, 1945. Henry Rudolf, April 21, 1945. Plus an unknown buried in Loches, as No. 4. This entry was posted in Creuse, Descartes/La Haye, Medieval history, Resistance in the Touraine Region, Transport ~ roal. rail, water, World War II and tagged Descartes, Loire Valley, Loire Valley History, The Conty-Freson Resistance Network, Touraine, Touraine History, WWII. Bookmark the permalink. Nice post Jim, I would be interested in any other posts that you make about the resistance, I think the local history groups have some pamphlets. Yes, there are a number of publications though the ones I’ve seen are more than pamphlets. What I’d like to produce in the future, in collaboration with native folk and perhaps the Tourist Board/Regional Gov. is a series of inexpensive/free pamphlets, in English + French, on the social life, history and topography of a number of villages around the area, link these with circular walks and lead some of the same. There are some short walking guides produced for Descartes which could be a good template.